I was lucky to find somewhere to park the car outside the Nag's Head in Edale on a Bank Holiday Saturday. The weather forecast was for a blustery day with occasional showers, so I decided to brave the holiday crowds in the Peak District for a circuit of the Kinder Scout plateau. 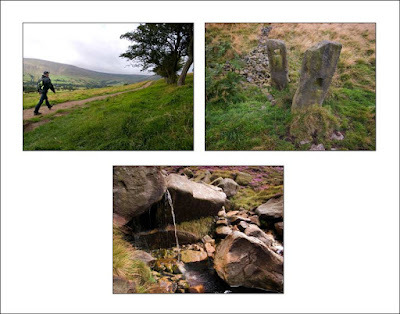 Kinder Scout is the nearest significant hill from home and is a great place to escape the office for some space and fresh air. My route took me across the fields to Crowden Clough, I always enjoy this route because it's quiet and has plenty of interest with a very short scramble at the end onto the plateau. The sun was shining as I set off, but by the time I arrived at Crowden Tower glorious Kinder Scout clag had set in reducing visibility somewhat! On through the Woolpacks, where I got stuck in the peat a couple of years ago (another story! ), the wind had picked up considerably. Is there ever a calm day on Kinder?